This next offering in the Gareth Glover Collection is rather a rare item; being the letters of a clerk in the Paymaster Generals office at Wellington’s headquarters, one Robert Duffield Cooke, future master of Hellens Manor in Much Marcle in Herefordshire. His letters were written to his father Charles Cooke, an official in the Land Tax Office, Red Lion Square. Perhaps a note of explanation as to the role of the Paymaster General’s department would be of use to readers. The moneys allocated for the expense of the army by the treasury were issued for payment of two types of expenditure; ‘Ordinaries’ were paid through the civilian service of the Paymaster Generals, which included the issue of pay and allowances to the various battalions, whose own paymaster then issued it to individual soldiers. ‘Extraordinaries’ were paid via the Commissary General’s department for payment to suppliers for victuals etc. However it is clear from Cooke’s letters and other sources that the Commissary controlled the release of all moneys by the commissary or Paymasters and effectively controlled the use of coin from the chests. Robert at the age of about sixteen (it is unclear if he was born in 1795 or 96) went out to the Peninsular War as a clerk in the Paymasters Office and wrote a number of lively and informative letters home. Robert is very revealing regarding the squalid conditions of Portuguese quarters and was clearly a young man with an eye for the women at every billet! He also gives some useful information of the Paymasters Office, a forgotten but vital cog in the Army machinery and the methods of transporting and maintenance of money chests at numerous locations. He later describes humorous instances such as the audacity of a fellow clerk (unnamed) who attempted to ride to hounds with Wellington and his Staff and became an embarrassing cropper! But even a pen pusher like Robert could not stay totally clear of the fighting, he describes vividly his two near death experiences whilst observing the siege of the forts at Salamanca, his sufferings along with the rest of the army on his retreat from Madrid and also paying a bribe to mount the breach at San Sebastian the night the town fell. I have kindly been given permission to publish these letters by Mr Rhys Griffith, Senior Archivist of the Herefordshire Archive Service, who holds these letters as reference cc57/44 21-37 in the archives of Hellens Estate, Much Marcle. These letters have been transcribed and a note attached explaining that Robert Cooke went to the Peninsular initially in the employ of a firm of sutlers or army suppliers; however a careful reading of the letters indicates that this is an error. 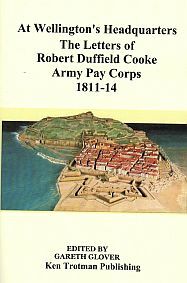 It is clear that Robert Cooke travelled to the Peninsular as a clerk in the Paymaster General’s Department and rose to become senior clerk at headquarters, returning to England in 1814 when he left the service. Cooke eventually married Mary Anne Wallwyn the adopted daughter of Mr Edward Wallwyn and through this marriage, eventually gained Hellens Manor and lived the life of a country squire, eventually dying in 1882 at the ripe old age of about 93. He is buried in Much Marcle Churchyard at St Bartholomew’s where there is a 7ft Family Grave Stone and there is a Plaque to Robert and his wife and daughter in the church in what was the Walwyn Pew at the top of the South Aisle for the Hellens family. It is now known as the Munthe Pew. These candid and sometimes shocking letters from an earthy young man, are a revelation on many levels, removing much of the gloss from the supposed gentility of the period, but also giving military historians a glimpse into an until now hidden aspect of the British Army in the Peninsular. I thoroughly enjoyed working on these letters and trust the reader will enjoy them too.